Home » New York City » Where Do New Yorkers Come From? Where Do New Yorkers Come From? Throughout it’s nearly 400-year history, New York City’s demography has been characterized by an ever-changing series of immigration waves, coming from all corners of the globe. The graphic below shows how these waves of immigration have varied over time. The circles represent each group’s share of New York City’s foreign-born population in the given year. Hover over the graphic for more information. Census statistics on country of origin are only available as far back as 1850. I estimated the figures for earlier years based on a variety of sources, explained below. Prior to 1776, all New York City residents are treated as foreign born. Credit to Asif Rahman for his awesome D3 punchcard implementation. Native Americans are not included in the chart because their population went to zero as soon as the Dutch bought Manhattan Island in 1626. At that time, and until the five boroughs were consolidated in 1898, New York City included Manhattan only. However, they did continue to inhabit the lands around Manhattan, and had a quite significant impact on the City’s history. 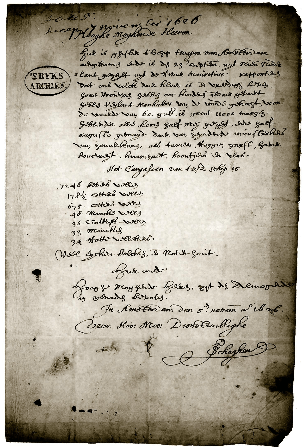 In 1641, an attempt by the Dutch to solicit taxes from the natives led to a violent conflict known as Kieft’s War, which nearly wiped the Dutch out. The Dutch ultimately beat the natives, but they were left in a weakened position, one which the British took advantage of in 1664 when they captured New Amsterdam and renamed it New York. Had it not been for Kieft’s War, the British may have never taken New York. And the history of the New York, and of the country, might have played out very differently. For 1850 to the present, the information above comes directly from the Census’ dicennial surveys. All of it exists somewhere on the census.gov website, but for anything before about 1990, it is extremely difficult to find and to work with. Fortunately, there are some great resources there that have made this data much more accessible. The Univeristy of Minnesota’s IPUMS-USA website allows you to slice and dice the numbers in nearly any fashion imaginable. The University also maintains the National Historical Geographic Information System, which in addition to the raw data provides boundaries in GIS format. The University of Virginia’s Historical Census Browser is not quite as comprehensive, but the format of the information is much easier to work with. For the years prior to 1850, the information available is scarce. Much of the estimates are based on one-off reports by city or state officials and personal accounts of people who lived during the period. For the 17th century, the best information available comes from New Yorke Considered and Improved, the accounts of John Miller, a Chaplain who lived in New York in the 1690s. 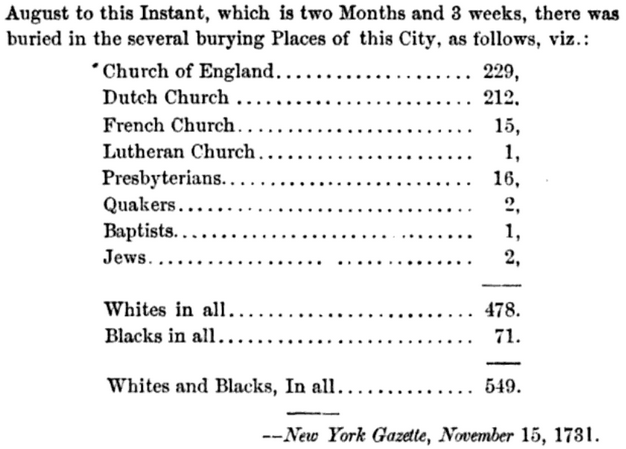 Miller’s breakdown of the population by religion provides a pretty clear picture of New York’s demographics in 1695. For the earlier part of the century, I looked to various records that list the City’s residents by name, and cross referenced the last names against various surname origin databases. One such list is from the Castello Plan, a 1660 map of lower Manhattan, including the names of property owners. The map, available as part of the NYPL Historical GIS Project, is itself pretty interesting. Seeing it overlaid on the current map of lower Manhattan shows how much of the land is man-made. 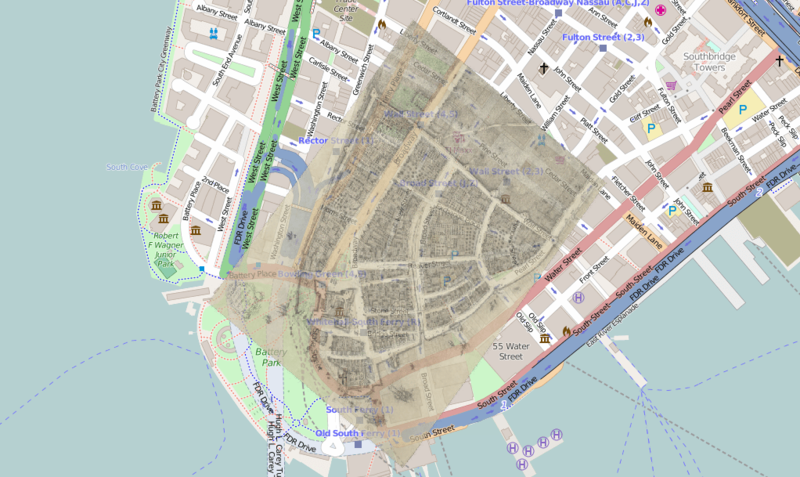 Not surprisingly, what is now Water Street used to be part of the East River. Also clearly visible is the wall at the settlement’s northern border, the current-day location of Wall Street. For another example, this list, the Dutch who swore allegiance to England after the surrender of New Amsterdam, provides a count of the number of Dutch families in 1664. The Iconography of Manhattan Island and The New York Genealogical and Biographical Record were two great resources for demographic information from this period. Into the 18th century, the information gets pretty spotty. There are also several city and state Census surveys that give snapshots of the demographics, such as the 1703 New York City Census. Other resources that I looked at include Population Distribution in Colonial America, the Population History of New York City, and A Century of Population Growth. This 1810 letter, which ranks New York City’s demographic groups in terms of size, comes from Timothy Dwight’s Travels in New-England and New-York. According to his description, “immigrants” from New England, represent roughly two-fifths of the City’s population. In 1810, the population of Manhattan had nearly tripled in the 27 years since the Revolutionary war ended, mostly due to an influx of migration from New England. For the later half of the 19th century, national origin information comes directly from the Census Dicennial Surveys. One ancillary piece from the Census data that I found interesting was the statistics on occupations, many of which I had never heard of. The table below has the full breakdown for New York City in 1850. If you are interested in the history of New York City, here is a stunning video released by the New York Times last Sunday – a 500 year animated timelapse from the perspective of One World Trade Center. Great graphic, but the log scale at the bottom makes it very hard to tell the change in magnitude in immigration. Most people, I suspect, aren’t going to catch that. Also the related absolute size of the populations is hidden by using the percentage method for the circles. Not sure how to improve that. It may just be too much info for this kind of graphic. Completely agree about a log scale not being so intuitive, especially for a bar chart. Though with the population going from 270 to 8M, a linear scale was just not possible. You could label each bar in the bar chart, at least. That would help. I think the log scale is fine, however the size of the bars makes it hard to see a jump of 1 million to 3.5 million (1880-1900), have you considered making part of the bars represented by foreign born? What about the Puerto Rican population? Since it is part of the U.S., I did not include Puerto Rico as part of NYC’s foreign born population. Though they are one of the City’s biggest cultural groups, and have been for the last 50 years. People of Puerto Rican descent make up about 9% of the population.